Crimes of violence often carry some of the stiffest penalties in the State of Florida. Therefore (it should go without saying), you will need an experienced, aggressive criminal trial attorney to handle your case from start to finish. As prosecutors, we handled every type of violent crime ranging from simple battery to domestic abuse to first degree murder. Our last four years at the State Attorney's Office were spent as felony prosecutors in Pinellas County. In these positions, we prosecuted some of the most violent gang members and dangerous criminals in the Tampa Bay area. Many of these cases received frequent media attention and can be read about in the PRESSROOM. Violent crimes can be separated into one of two categories. Misdemeanor violent crimes (such as domestic battery or battery) and felony violent crimes (aggravated battery or most other violent charges). The difference between a misdemeanor and a felony charge can be slight. Prior misdemeanor battery convictions can turn another such charge from a misdemeanor to a felony battery based on priors. The same basic battery can become an aggravated or a felony battery depending if a weapon was used or if the victim suffered an injury. In most crimes but especially those involving a violent crime allegation, it is vital to have a criminal defense attorney representing your interests immediately. Many times your attorney may be able to speak with the prosecutor and convince them not to file a charge or reduce it from a felony to a misdemeanor. Your lawyer may also work with the victim and prepare a “Request Not to Prosecute” form letting the State Attorney know about the victim’s wishes. Additionally, the lawyers of Blake & Dorsten, P.A. can also represent you in any civil injunction matter that may come about as a result of the battery allegations. Blake & Dorsten, P.A. has the experience, persistence and dedication to handle your violent crime case. Whether your case needs to be investigated and prepared for a jury trial or simply needs an experienced negotiator to obtain the best possible outcome, the lawyers of Blake & Dorsten, P.A. will handle your violent crime case the only way we know how... with lots of hard work and plenty of research, dedication and preparation. If you are being investigated for, or are currently charged with, any of the following crimes, you will need an experienced and aggressive trial attorney that will stand up and protect your rights and make every effort to regain your freedom. All crimes prosecuted under Florida's 10/20/LIFE law. Contact Blake & Dorsten, P.A. 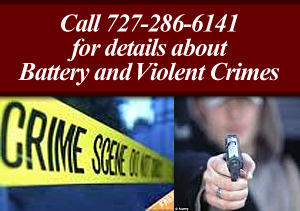 today for a free consultation on any Crime of Violence that you may be facing.